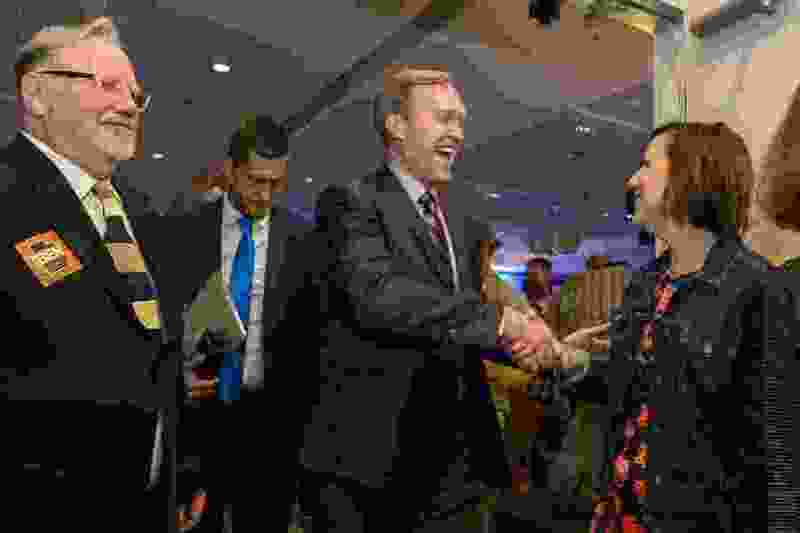 (Leah Hogsten | The Salt Lake Tribune) Utah's 4th Congressional District Democratic challenger, Salt Lake County Mayor Ben McAdams is congratulated on a race to close to call at the Utah Democratic election night headquarters at the Radisson Hotel Salt Lake City, Tuesday, Nov. 6, 2018. Ben McAdams' lead over Rep. Mia Love, R-Utah, continued to slip away Wednesday after an updated vote count out of Salt Lake and Juab counties showed the incumbent congresswoman gaining crucial votes. The Democratic candidate and current Salt Lake County mayor is now leading by 873 votes after more than 12,000 ballots were added to the 4th Congressional District. And with the heavily-Republican Utah County expected to update its count on Friday, McAdams precarious lead of 0.36 percentage points is likely to change, and could potentially erode away entirely. After Wednesday’s update, Love’s campaign manager Dave Hansen appeared more confident than at any point since polls closed last Tuesday. “Since Election Day, Mia has consistently improved her margin and is on a steady path to victory,” Hansen said. Andrew Roberts, McAdams' campaign manager, said the vote results since Election Day have seen “ups and downs” for the campaigns. The new numbers were released on the same day that Love sued Salt Lake County Clerk Sherrie Swenson. Her campaign is seeking a court order to halt the counting of ballots until they can be allowed the opportunity to oversee and challenge the verification of voter signatures on mail-in and provisional ballots. A hearing on that suit is scheduled for Thursday at 2 p.m. in 3rd District Court.